Easter Island and a distant dwarf planet. What do they have in common? The answer is Makemake. To English speakers, that looks like make-make, but it's a a Polynesian god whose name is pronounced MAH.kay.MAH.kay. In the Rapa Nui mythology of Easter Island he was a fertility god and the creator of humanity. But how did his name come to be given to a small frozen body seven billion kilometers (four billion miles) from the Sun? Makemake was discovered on March 31, 2005 by Mike Brown, Chad Trujillo and David Rabinowitz. They have discovered many icy bodies beyond Neptune – bodies known as trans-Neptunian objects. When the discovery was reported to the Minor Planet Center of the International Astronomical Union (IAU), it got the provisional designation 2005 FY9. After the orbit of the new object was confirmed, it got the minor-planet number 136472. The discovery team privately nicknamed it Easterbunny because it was discovered a few days after Easter, and (136472) FY9 is a bit of a mouthful. Once an object has a number the discoverer may choose to give it a name. The IAU would not only consider “Easterbunny” frivolous, but also Makemake is a classical Kuiper belt object. Under the IAU's naming rules, these objects get names associated with creation mythology. To keep the Easter connection, the discovery team proposed the Easter Island creation deity. In 2008 the IAU listed Makemake as a dwarf planet, a category of heavenly object that didn't even exist when it was discovered. A classical Kuiper belt object orbits the Sun beyond Neptune at a distance that prevents Neptune's gravity from making its orbit unstable. The orbits of these objects also have a low eccentricity. The eccentricity of an orbit tells us how circular it is on a scale from 0 to 1. A circular orbit has zero eccentricity, and the more elongated the orbit, the closer the eccentricity gets to one. For example, Pluto's orbit has an eccentricity of 0.25 which is greater than that of any of the eight planets. Makemake's orbit has an eccentricity of 0.15. On average Makemake orbits the Sun at about 46 AU. (An AU – astronomical unit – is the Earth-Sun distance.) Its year is 310 Earth years long. Although Makemake's orbit isn't highly eccentric, it's strongly tilted. Five billion years ago when the Sun was forming, a flat disk of leftover material swirled around its equator. Out of the material in the disk the planets and other bodies formed. 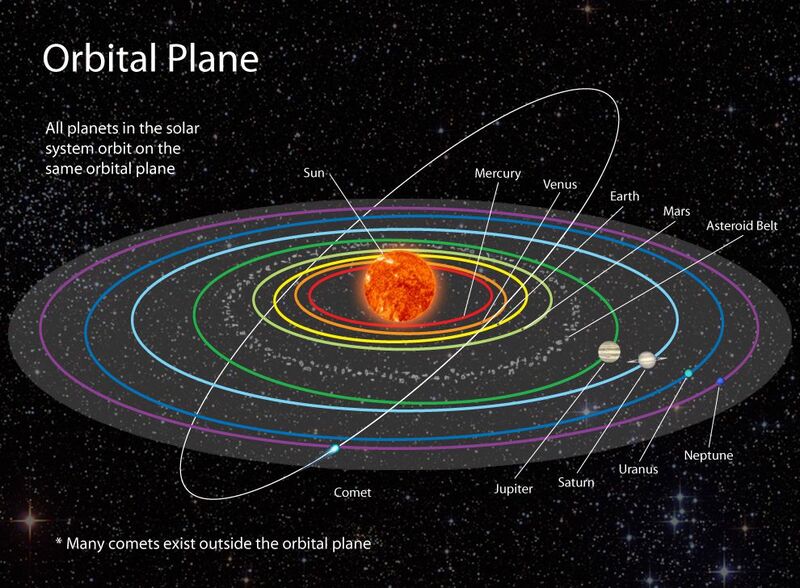 The disk is gone, but Solar System objects still orbit in that plane, which is known as the ecliptic. Makemake isn't shown on the diagram, but like the comet, its orbit is tilted to the ecliptic – in Makemake's case by 29°. Only a small fraction of its orbit is near the ecliptic. Makemake is bright – why did it take so long to discover it? Usually if you're looking for asteroids or Kuiper belt objects, you'd look where most of them are – near the ecliptic. Since Makemake spends most of its time well away from the ecliptic, it wasn't so likely to show up in a survey. However, it was fairly near the ecliptic when the discoverer of Pluto, Clyde Tombaugh, was searching the skies. 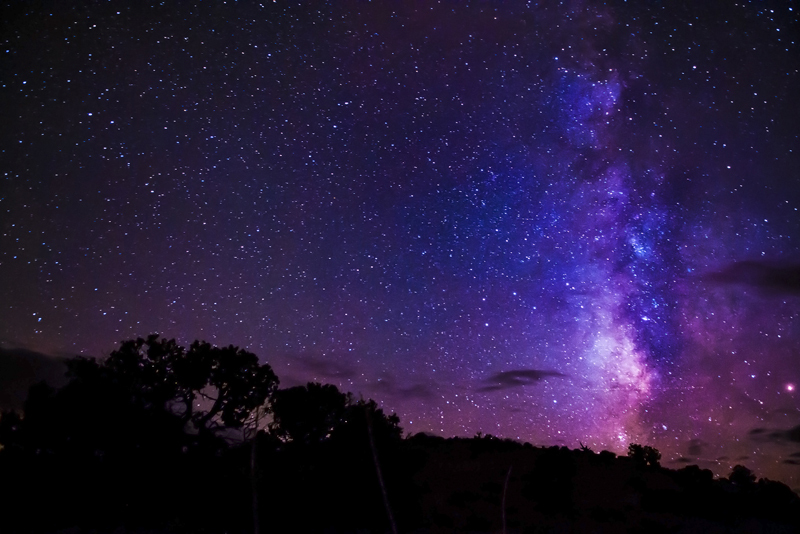 It's large enough and bright enough that he could have seen it if it hadn't been so close to the Milky Way. However Makemake was well camouflaged against the starry background. Since Makemake is a small far-away object, our knowledge can't be detailed. Think about how long we studied Pluto, yet the New Horizons mission surprised us again and again on its 2015 flyby. Obviously we know that it's cold cold out there in the Kuiper belt. Makemake's mean surface temperature is estimated at -240 °C (-400 °F). Working out the dwarf planet's rotation period is tricky at this distance, and estimates range from 8 to 22.5 hours. It seems to be covered in a layer of methane ice, mixed with some ethane and tholins. Tholins form in a chemical reaction when substances such as methane are exposed to ultraviolet radiation. They give Makemake – and some other icy bodies – a reddish color. Interestingly, observers saw small dark warmer patches which were something of a puzzle, but a surprising 2015 discovery seems to have solved that mystery. 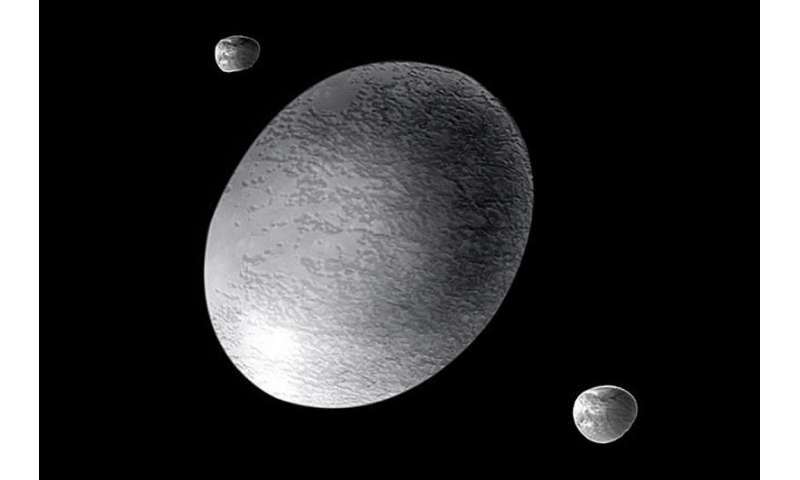 For ten years it had seemed that Makemake had no moon. Then in 2015 astronomers using the Hubble Space Telescope found a small dark moon. It's quite possible that this is what looked like dark patches on the dwarf planet. The moon hasn't been given a name, but its designation is S/2015 (136472) 1, showing that it's the first known moon of Makemake, and that it was discovered in 2015. It's been nicknamed MK 2. 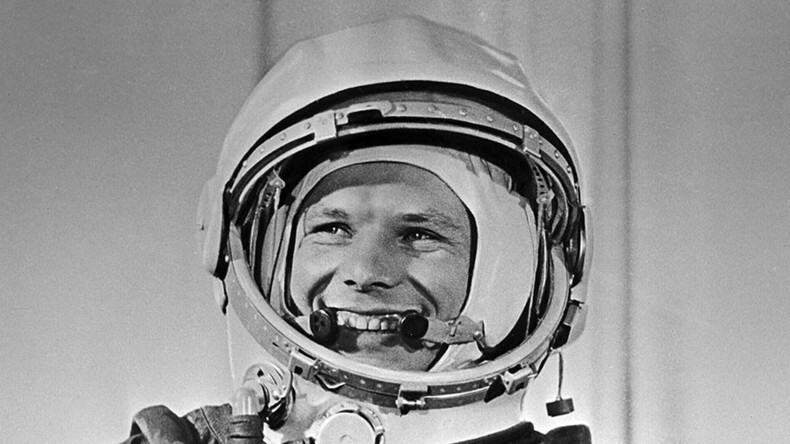 The diameter seems to be about 175 km (110 mi), taking at least 12 days to orbit at around 21,000 km (13,000 mi). Since knowing the orbital period of a moon allows astronomers to estimate the mass of the main body, finding MK 2 should lead to a better understanding of Makemake.